To Build Fit Enterprise Solutions, Be Physical … | Certis Information Services, Inc. The British and the Americans speak the same language. But, say “I have a flat” to a British, and it means something completely different than said to an American. The former would congratulate you, and the latter would feel sorry for you. Flat in the UK means an apartment. Flat in Houston means a flat tire. The same 4 words, arranged in the exact same way, in what is ostensibly the same language, and yet either speaker would confuse their audience, if the audiences were transposed. It is the same thing in business – if you cross different corporate cultures or even inter-organizational boundaries, industry terminology might sound the same but mean very different things. Sometimes we think we are communicating, but we are not. Why is this a problem? Because it is not possible to build an enterprise data management solution to serve all departments without addressing variations in expectations for the same word. Especially if the term in question is one that defines your organization’s values and activities. In the corporate world of Energy E&P, the word “completion” means different things to the different departments. If you mention a “Completion” to a Landman, he will assume you are referring to the subsurface horizon for his leases (it is more complex than this, but for the sake of this argument we need not dive into details). If a “Completion” is referenced to a Production Engineer, she immediately thinks of the intersection of a wellbore and a reservoir horizon. To a Completion Engineer, the same term means the process of completing a well after the well has reached final depth. As organizations’ data management practice become more matured, they start to make their way towards the right of the EIM MM (Enterprise Information Management Maturity Model). Centralized solutions such as Master Data Management (MDM) are important and are designed to serve ALL departments to break as many silos as possible. Naturally, to create a centralized solution that addresses needs across the enterprise, you must first reach consensus on how to build that solution. The solution must ensure that the data is NOT LOST, NOT OVERWRITTEN and is FULLY CAPTURED and useful to EVERYONE. What is the best way to reach consensus without the risk of losing data? By basing your data on the physical world and capture granular data as practically possible, you not only make it possible to capture all related information but also possible to report it in any combination of grouping and queries. See the example in figure 1. I have seen systems that ignore wellbore data yet store only completions per well. At other clients, I have seen systems that take short cuts by storing wells, wellbore and wellbore completion data in one line (this necessitates overwriting old completion data with new everytime there is a change), these are “fit-for-purpose” systems. These are not enterprise level solutions, but rather serve departmental needs. Too often systems are designed for the need of one group/department/purpose rather than for the need of the company as a whole. However, if the needs of the whole are defined and understood, both company and groups will have what they need and then some. In Figure 1 above, how would you store the data for the well in your organization or your department? Would you define the data captured as one well, three bores, and three completions? Or maybe two completions? One? Depending on your department or organizational definitions, any of the above definitions could be fit-for-purpose correct. Accounting systems might keep track of ONLY one completion if it made Payroll and Tax sense. While Land may only keep track of 2 completions if the bores are in two zones. 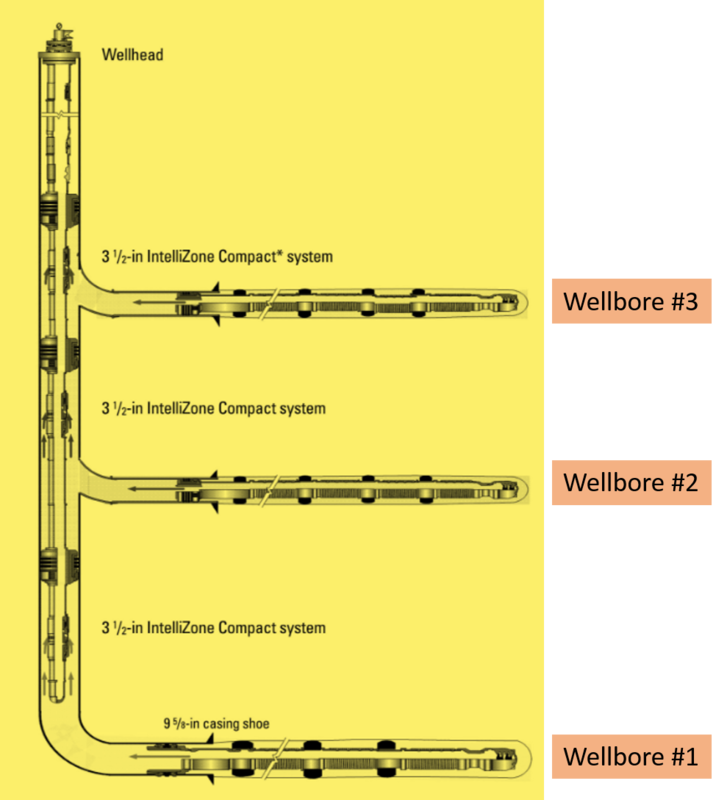 An engineer would track three completions and will be specific to one completion per wellbore. The regulatory department may want you to report something entirely different. How do we decide the number of completions so that the information is captured accurately, yet remains useful to a Landman, Accountant, Engineer, and Geoscientist? Build based on the physical reality and stay granular. In Figure 1, physically speaking, we see one well with three paths (3 wellbores). Each bore has its own configuration that open to the reservoir (completions). In total, this well has three different ‘Completions’, one ‘Completion’ for each of the horizontal bores. Accounting can query how many different cost centers the well has, and depending on the production (and other complex rules) the answer could be three but it could be 1. Depending on the lease agreement, Landman could get a result of one or 3 completions. An engineer can also easily query and graph this data to find the three pathways, and determine each completion job per wellbore. While it could be argued that data needs to be presented differently to each department, the underlying source data must reflect the physical truth. After all, we cannot control what people call things and certainly cannot change the lingo. This entry was posted in Data Quality, Information Management, Knowledge managmeent, Uncategorized and tagged gas, Oil & Gas Data Management, Oil well, oilfield on June 23, 2016 by Certis Inc..